Ashland is a city in Jackson County, in the State of Oregon. Venture out of the city with trips to Medford (Rogue River, King of the Rogue Outfitters, & more), Jacksonville (Jacksonville Cemetery & Art Presence Art Center) and Grants Pass (Wildlife Images - Rehabilitation & Education Center, Rogue Creamery Dairy Farm, & more). And it doesn't end there: tour the pleasant surroundings at Lithia Park, look for gifts at Tudor Guild Shop, take in the views from The Wimer Covered Bridge, and browse the collection at Jackson County Genealogy Library. For other places to visit, more things to do, reviews, and more tourist information, read our Ashland sightseeing planner. Los Angeles to Ashland is an approximately 5.5-hour combination of flight and bus. You can also drive; or take a bus. Traveling from Los Angeles in April, expect Ashland to be slightly colder, temps between 67°F and 42°F. Cap off your sightseeing on the 19th (Fri) early enough to go by car to Crater Lake National Park. Change things up with these side-trips from Crater Lake National Park: Colliding Rivers Viewpoint (in Glide), Prospect (Union Creek Trail, Mill Creek Falls, & more) and Umpqua National Forest (in Umpqua). Spend the 20th (Sat) exploring nature at Crater Lake National Park. Next up on the itinerary: immerse yourself in nature at Collier Memorial State Park, hike along Garfield Peak, look for all kinds of wild species at Rogue River Gorge Viewpoint, and stroll through Watchman Peak. To find other places to visit, ratings, and other tourist information, read Crater Lake National Park trip itinerary planning site . Traveling by car from Ashland to Crater Lake National Park takes 2.5 hours. Alternatively, you can take a bus. Expect a daytime high around 67°F in April, and nighttime lows around 42°F. Finish your sightseeing early on the 25th (Thu) so you can drive to Bend. An old logging town at the crux of the high desert and ponderosa pine forest, Bend melds a love of the outdoors with cosmopolitan flair. You'll find plenty of places to visit near Bend: Prineville (Steins Pillar & Wildland Firefighters Monument), Tam McArthur Rim Trail (in Sisters) and Smith Rock State Park (in Redmond). And it doesn't end there: explore the world behind art at High Desert Museum, look for all kinds of wild species at Fort Rock State Natural Area, trek along Deschutes River Trail, and delve into the lush surroundings at Shevlin Park. To see where to stay, reviews, ratings, and more tourist information, go to the Bend tour planner. Traveling by car from Crater Lake National Park to Bend takes 3 hours. Alternatively, you can do a combination of taxi and bus. Expect little chillier temperatures when traveling from Crater Lake National Park in April; daily highs in Bend reach 58°F and lows reach 33°F. Wrap up your sightseeing on the 2nd (Thu) to allow time to drive to Hood River. The city of Hood River is the seat of Hood River County, Oregon, United States. Explore Hood River's surroundings by going to The Dalles Murals (in The Dalles), Multnomah Falls (in Bridal Veil) and Timberline Lodge and Ski Area (in Timberline Lodge). 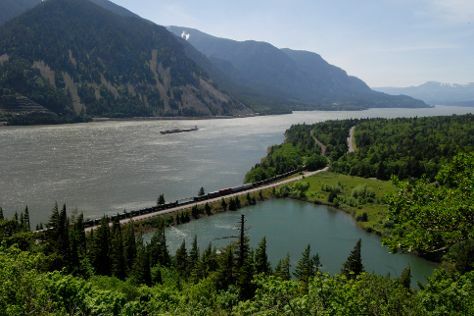 There's much more to do: look for all kinds of wild species at Columbia River Gorge National Scenic Area, take in the pleasant sights at Rowena Crest Viewpoint, tour the pleasant surroundings at Historic Columbia River Highway State Trail, and explore the wealth of natural beauty at Mt. Hood National Forest. To find other places to visit, traveler tips, more things to do, and other tourist information, go to the Hood River itinerary planner . You can drive from Bend to Hood River in 3.5 hours. Other options are to do a combination of flight and bus; or take a bus. Traveling from Bend in May, expect a bit warmer with lows of 49°F in Hood River. Finish up your sightseeing early on the 8th (Wed) so you can go by car to Portland. Change things up with these side-trips from Portland: Schreiner's Iris Gardens (in Salem) and Willamette Valley Vineyards (in Turner). Dedicate the 11th (Sat) to wine at some of the top wineries in the area. 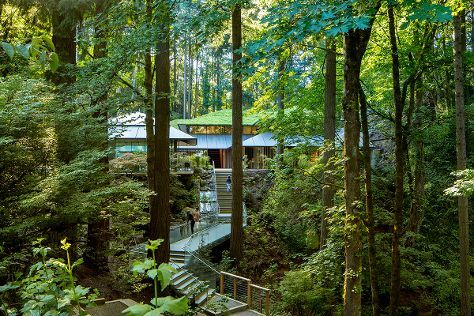 There's still lots to do: take in nature's colorful creations at Portland Japanese Garden, get outside with Portland Timbers, meet the residents at Oregon Zoo, and trek along Forest Park. To see other places to visit, traveler tips, reviews, and more tourist information, go to the Portland holiday planning website . You can drive from Hood River to Portland in 1.5 hours. Other options are to take a bus; or take a train. In May, daytime highs in Portland are 70°F, while nighttime lows are 51°F. Finish your sightseeing early on the 16th (Thu) to allow enough time to drive to Astoria. Astoria, named for famed fur trader John Jacob Astor, resides near the mouth of the Columbia River. Change things up with these side-trips from Astoria: Seaside Aquarium (in Seaside) and Cannon Beach (Cannon Beach, Oswald West State Park, & more). Spend the 20th (Mon) exploring nature at Fort Clatsop National Memorial. Next up on the itinerary: admire all the interesting features of Astoria Column, examine the collection at Seaside Inverted Experience, admire the majestic nature at Fort Stevens State Park, and don't miss a visit to Seaside Beach Lewis and Clark Monument. For ratings and tourist information, you can read our Astoria trip planner. Getting from Portland to Astoria by car takes about 2 hours. Other options: take a bus; or do a combination of train and bus. Traveling from Portland in May, expect nights in Astoria to be about the same, around 48°F, while days are a bit cooler, around 62°F. Cap off your sightseeing on the 22nd (Wed) early enough to go by car to Tillamook. The city of Tillamook is the county seat of Tillamook County, Oregon, United States. You'll find plenty of places to visit near Tillamook: Manzanita (Manzanita Beach & Cloud and Leaf Bookstore), Nehalem Bay State Park (in Nehalem) and Cape Kiwanda State Natural Area (in Pacific City). And it doesn't end there: explore and take pictures at Three Capes Scenic Drive, look for all kinds of wild species at Kilchis Point Reserve, explore the galleries of Tillamook Air Museum, and visit a coastal fixture at Cape Meares Lighthouse. For other places to visit, reviews, photos, and other tourist information, refer to the Tillamook holiday planner. You can drive from Astoria to Tillamook in 2 hours. Alternatively, you can take a bus. The time zone changes from Pacific Standard Time (PST) to Mountain Standard Time (MST), which is usually a 1 hour difference. May in Tillamook sees daily highs of 62°F and lows of 46°F at night. Wrap up your sightseeing on the 26th (Sun) early enough to drive to Newport. Explore the numerous day-trip ideas around Newport: Yachats coastline (in Yachats), Lincoln City (Prehistoric, Lincoln City Glass Center, & more) and Proposal Rock (in Neskowin). Next up on the itinerary: look for all kinds of wild species at Yaquina Head Outstanding Natural Area, admire nature's wide array of creatures at Oregon Coast Aquarium, take a memorable drive along Otter Crest Loop, and engage your brain at Hatfield Marine Science Center. To find more things to do and other tourist information, read Newport driving holiday planner . Traveling by car from Tillamook to Newport takes 2 hours. Alternatively, you can take a bus. Traveling from Tillamook to Newport, you'll gain 1 hour due to the time zone difference. In May in Newport, expect temperatures between 58°F during the day and 46°F at night. Cap off your sightseeing on the 1st (Sat) early enough to go by car to Florence. Florence is a coastal city in Lane County, in the U.S. Get out of town with these interesting Florence side-trips: Cape Perpetua Visitor Center - Siuslaw National Forest (in Yachats), Tsunami Gallery (in Gardiner) and Shore Acres State Park (in Coos Bay). The adventure continues: tour or see a game at Sand Master Park, visit a coastal fixture at Heceta Head Lighthouse, tour the pleasant surroundings at Heceta Beach, and play a few rounds at Bandon Dunes Golf Resort. To find reviews, photos, maps, and more tourist information, refer to the Florence trip itinerary planner . Drive from Newport to Florence in 1.5 hours. Alternatively, you can take a bus. In June, plan for daily highs up to 65°F, and evening lows to 52°F. Cap off your sightseeing on the 6th (Thu) early enough to catcht the bus to Eugene. Eugene is a city of the Pacific Northwest located in the U.S. You'll find plenty of places to visit near Eugene: McDowell Creek Falls (in Lebanon), Albany (The Historic Carousel and Museum, Hoffman Bridge, & more) and Corvallis (Riverfront Commemorative Park & Siuslaw National Forest). And it doesn't end there: admire all the interesting features of Hayward Field, head outdoors with Thompson's Mill State Heritage Site, tee off at Tokatee Golf Club, and snap pictures at Chambers Railroad Bridge. For more things to do, traveler tips, and more tourist information, refer to the Eugene route planner. You can take a bus from Florence to Eugene in 1.5 hours. Alternatively, you can drive. Expect somewhat warmer weather when traveling from Florence in June: highs in Eugene hover around 78°F, while lows dip to 49°F. Wrap up your sightseeing on the 12th (Wed) early enough to travel back home.